Chic well equipped Visit England Gold Award 2019. Two double bedroomed Cottage sleeping up to 4 (plus a baby in cot) right in the Centre of Town, up a quiet Victorian alley. With Luxury touches. Luxury Egyptian cotton bed linen, silk filled duvets and pillows and Fluffy 650 gsm towels and Free WiFi. Pet and child friendly. Private gated courtyard equipped with garden furniture. Tewkesbury Abbey,Shops, Restaurants and pubs all within a short walking distance. You do not need a car with everything nearby including public transport. Great location for sightseeing Tewkesbury & Cotswolds and only 15 mins from Cheltenham Racecourse. Its a great location too for Cyclists, Walkers, Fishing, Golf. We have only moved to Tewkesbury 2013 and love it so much we thought we would run holiday cottages so others could experience its delights too! We have only been married for six years but as a young at heart middle aged couple who like staying in nice places ourselves thought this would help in making the experience enjoyable for you too. Great location in the centre of Tewkesbury up a quiet victorian alley, Tewkesbury is on the edge of the Cotswolds, and is great for Walking, Cycling, Fishing, Golfing and Sightseeing. Tewkesbury itself has a historic Abbey and lovely antique shops and lots to do in town and nearby. Free wifi. Luxury bedding and towels included, with lots of other luxury touches. Gold Award winning from Visit England Tourist Board 2019. Everything is on your doorstep. No car needed! Stay at our lovely two bedroom cottage sleeping up to 4 right in the Centre of Town, up a quiet Victorian alley. Great location for sight seeing Tewkesbury & Cotswolds and only 15 mins from Cheltenham Racecourse. Its a great location for Cyclists, Walkers, Fishing and Golfing too! Lovely courtyard to sit out in, very private as fenced and gated. Free WiFi and we are Pet and Family friendly and have tried to provide everything to make your stay comfortable and we live nearby and will help in any way to achieve this! You are sure to enjoy the roomy comfortable lounge with comfy sofas and flat screen TV.There are magazines and books too if you fancy putting your feet up and having a good read. Welcome tea/coffee/milk & sugar plus some biscuits provided to enjoy after your journey. Bathroom with bath and shower over with wc. Heated towel rail. 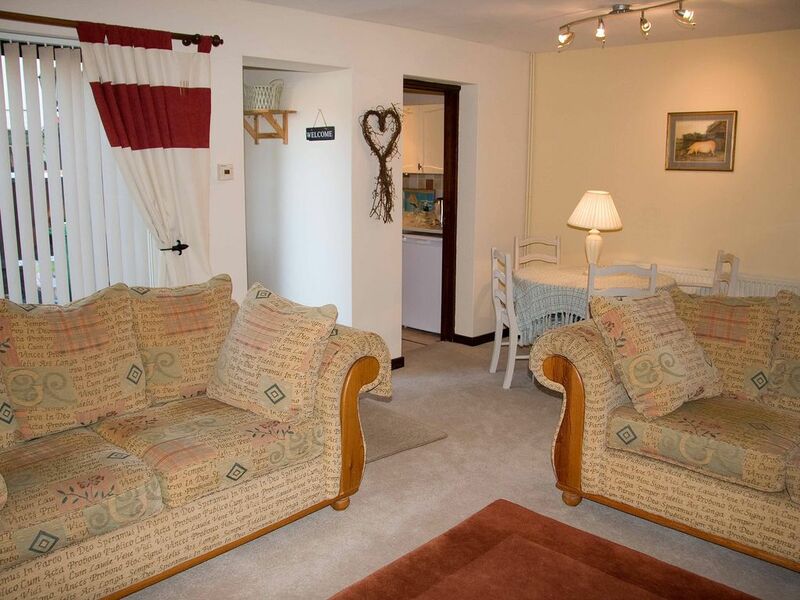 Two large comfy sofas, flat screen TV, nest of tables, table lamps, CD and DVD player, usb docking station. Dining Table & 5 chairs available (2 x Carvers with arms). Plush carpeting. Notes on accommodation: Bedrooms are accessed via a staircase with handrail. Bathroom and toilet upstairs. Bathroom has bath and shower over. 1 or 2 dogs/animal on request. Outside: Patio with garden furniture Utility Room: n/a Cleaning / Towels / Linen / Maid service: Cleaning, towels and linen provided free of charge. Cot and high chair available on request. Free wifi. Other: We have tried to provide everything you will need in the kitchen. Plenty of crockery, glasses and cutlery. Enjoyed our stay very much with our two dogs who settled down quickly there. The property was spacious and clean and everything we needed for a weekend away. There were complimentary biscuits left for us which was a very nice touch after the journey down there. Everything on the doorstep, although we did use the car to take the dogs to the flood plains of the rivers for a very enjoyable walk. Would have no hesitation in booking this property again. Cosy with great touches, a home from home. Short Stay which was just perfect for us. A stones throw from the town centre, in very well presented cottage which had everything you needed. Very quiet area. The 2 bed cottage is very comfortable with some really nice touches that make it a home from home. This is a lovely cottage. It's right in the middle of Tewkesbury, located close to everything. It's comfy, well appointed. Although there are 2 bedrooms, it might be a bit crowded for 4 grownups in the winter...it depends on your need for space...and how much you like your traveling companions. There's a lovely outdoor patio, when the weather is nice. Although the towels are wonderful (really, I need to buy some! ), bring your own wash cloth...none are provided. What's up with that? We had the same experience when we got to Paris. Do Europeans not use wash cloths? Even so, we'd stay there again. Thanks for your very positive review so glad you loved our cottage and had an enjoyable stay. We would love to Welcome you back anytime! Great for exploring Cotswolds, Town Location, No car needes, Broadway only 25 mins drive away, Stow on Wold/Bourton on Water c 30mins drive. Cheltenham Spa 15 mins drive. Great for hiking,mountain biking and golf. Ashchurch Railway Station nearby, about an hour from Birmingham, Cardiff and Bristol Airports. Taxis should be booked in advance, not parked at Railway Station. Only a few minutes from shops, pubs and restaurants. Lots of takeaways also available a few minutes walk away. 5 mins walk to Tewkesbury Abbey! Booking Notes: Book via this website or email lilydalecottage@gmail.com or via www.lilydaleholidaycottage.com or ring 01684 273796/07861 419186 Changeover Day: Flexible Notes on prices: We offer 3 night weekends arriving Friday or Saturday, 3/4 night mid-week stays arriving Monday or 7 night stays arriving Friday/Saturday or Monday. Please ask if you require anything different we will try to help! From £70.00(low season) to £110.00(High Season)per night for 4 people inclusive of bedlinen, towels and wifi - Min 3 nights at this price. Extra Person /bed linen - £10 a night extra. Weekly prices from £450 to £750. Contact owner to Book/Check Prices.